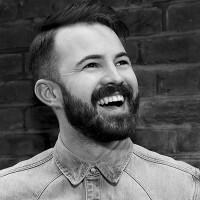 Home > Blog > What can global music festivals teach a B2B audience? Millions of people flock to music festivals globally each year to see world-renowned artists. But megastars from Guns N’ Roses to Beyonce – and the festivals that host them – command a premium; and the festival experience has had to adapt to warrant increasing ticket prices. Gone are the days of your favourite artists hitting a stage with just some dance moves and an extended guitar solo. Instead, the increasing portability of technology has allowed set designers to create truly immersive stages that captivate their audiences and fuel their imaginations. This led me to think about how the technology that’s regularly adopted by musical festivals could adapt to bring innovative customer experiences in your next B2B event, marketing campaign, roadshow or Customer Experience Centre. Here’s 5 that are leading the way. You’d be right in thinking that holograms are not new technology: the first functional optical hologram that replayed 3D objects was invented in 1962. Nevertheless, introduce 600 laser beams, 10M pixels of video and 20m-wide holograms for floating astronauts so realistic that the audience wants to reach and touch them, and it all starts to sound a whole lot more fascinating, right? Could certainly draw your customer into a demonstration in whole new ways! Legendary Swedish DJ, Eric Prydz, is well known for putting on a good show, and his latest has topped everything in both scale and impact. EPIC 5.0, the most recent in the Eric Prydz in Concert collection, took place in London’s Victoria Park; drawing an audience of 15,000 to soak up an audio-visual feast of electronic music, video and lighting effects. Holograms and lasers are a trademark of Prydz’s shows and EPIC 5.0 didn’t disappoint, pushing innovative effects with the most recent technology. There were animations growing and twisting around the stage in time to the beat, holograms of astronauts, satellites and tornadoes, and lasers radiating over the audience in every colour and configuration. Regardless of the hype around virtual reality, augmented reality is where an escalating number of businesses are focusing their attention. Why? There are some 82M VR units globally right now, but with augmented reality technology embedded in the majority of mobile phones, AR is currently peaking at over 3BN units. With devices already in people’s hands, you get the perfect recipe for innovation and disruption in many sectors – and the festival scene has been fast to react. Recognising the fact that a brand new generation of viewers will be on their phones during live events, Eminem surfaced ‘Eminem Augmented’ at this year’s Coachella music festival. Through the application, festival visitors were met with a Godzilla sized Marshall Mathers; knocking down buildings, swiping helicopters along with a floating Jason mask with a butcher knife and chainsaw cutting through the crowd. The application made the rappers show seem larger than life and included changed virtual stage sets from song to song. By catering to this societal change, Eminem was able to provide Coachella attendees with something they’ve never seen before – and give fans the ability to share their tech-driven experience via social websites to reach a global audience. 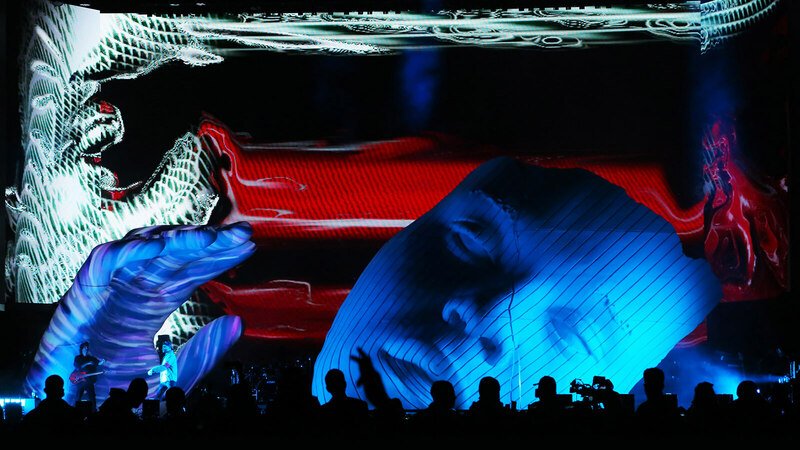 A few years ago, video projection mapping was an art form. Today, a head-turning projection is par for the course for any music festival collection, product launch, or show. Video projection mapping has the ability to transform any object into a screen. And the projection no longer has to be level: projection mapping has the capacity to take a real world object – even a whole building – and project content onto its walls without any distortion. The best projection mapping projects succeed in improving, rather than defacing, the architecture they are beamed onto. The scale in itself can be spectacular and the illusion of objects around us becoming alive can be incredibly exciting. Headline act at Coachella 2018, THE WEEKND, contacted British designer Es Devlin to create projection mapped material based on his work on the soundtrack for blockbuster film, Black Panther. In his Coachella show, a 30-foot-high face sculpture formed the background to the Canadian singer. At the start of the set, the face splits in two though a scar to make a large opening through which the singer emerges. During the performance, projection mapped lighting plays across the ‘surface’ of the two sculptures and a set of screens behind. You no doubt already know about RFID: along with its cousin, NFC, RFID is a low-range radio technology used for all kinds of tagging, validation and monitoring purposes. It’s being integrated in various different ways into events. Attracting more than 200,000 attendees, Tomorrowland, an electronic music festival held in Boom, Belgium, needed an efficient method to handle access. They decided to use RFID to provide entry authentication and also to facilitate cashless payments on site. Tomorrowland 2017 was a totally cashless festival using its own currency, ‘Pearl’. Attendees had to load their RFID bracelets in order to buy food, drinks and goods at the venue. The smart bracelets were also used in the festival’s eight live simultaneous broadcasting events in venues around the globe. The bracelets stored each ticketholder’s personal information, making them non-transferable and assisting the promoter in avoiding the complexities of the secondary ticket market. The additional security this provided additionally profited the organisers when a fire broke out on the main stage at the Festival’s Barcelona event, when 22,000 party-goers had to be evacuated. With integrated ID, the bracelets meant that attendees could easily be accounted for. Music festivals teach us a thing or two about social media. Festivals like Bonnaroo and Lollapalooza know their young target audience and are leveraging social media accordingly. They’ve established a whole culture around each festival and use social networks to publicise it. From Instagram to YouTube, festivals are connecting to fans in brand new ways, above all to build suspense for the 50+ weeks when a festival is not physically happening. This really is the cleverest thing that festivals are doing these days. For the entire year before an event, Facebook pages are hard at work, teasing fans. From countdowns to the date of the festival, hints as to the line-ups and teasers from headline acts, the opportunities are endless. For Bonnaroo’s line-up statement, the festival organisers streamed a celebrity-filled video on YouTube where the headliners were announced one by one. Through the hour long broadcast, they invited constant involvement on Facebook, Twitter and Instagram with hashtags. This all-encompassing and innovative idea can, of course, be used for commercial brands, e.g. for a store opening or product launch. Tomorrowland, the global electronic music festival we mentioned earlier, is also a pioneer. In 2017, it recorded the largest throughput of social network participation of any music festival ever, creating an extraordinary 1.2BN points of contact across many channels. A constant video live stream, hosted on the Tomorrowland website, app, Instagram and Facebook throughout the festival is how this number grew to hit the billions. Live streams were pushed out all over the world, in real time. Tomorrowland even hosted streams on Tencent, the Chinese social network platform used in Asia where Facebook and Instagram are either not prevalent or barred. Virtually or physically, the whole planet was able to experience the magic of Tomorrowland. And for those who missed the live streams, the post-produced movies on YouTube generated significant participation as well. Social networks have changed the music festival sector – for the better, providing a rich experience that lasts for the whole year, and – far from reducing live attendance audiences – is packing in customers more than ever. Stephanie Meyer, global head of Marketing Operations at GE Healthcare says: “It’s not about B2B, or B2C — it’s about B2 Human. It’s about how we engage with our customers in deep, relevant and varied ways.” She couldn’t be more right. Be it customer support, product quality or just the way the customers feel about the companies they do business with, customer experience rises to the top as to whether a consumer continues conducting business with a brand or not. Today, 89% of businesses compete mainly on the basis of customer experience* – up from only 36 percent in 2010. But while 80% of businesses think they provide superb experiences, only 8 percent of customers agree. Put simply, companies have some way to go. And that means there’s a tremendous opportunity to disrupt the competition or increase market share in any industry. Everything a brand does – advertising, research, marketing etc. – all shape the customer’s experience and brand perception. The company might define its guarantee, but it’s the customer who determines whether or not they’ve delivered.